Disclosure: I was provided with a package from Libby’s to complete my post. All thoughts and opinions are 100% honest and are that of my own. During the summer my family and I like to go out to our local lake and have picnics. We usually take an assortment of food with us, including sandwiches, salads and snacks. Libby’s canned fruits and vegetables definitely make summer recipes much easier to make! I hope that you enjoy the recipe below and share some of your favorite picnic foods with us. Looking for a great alternative to your regular mayo and/or mustard routine? 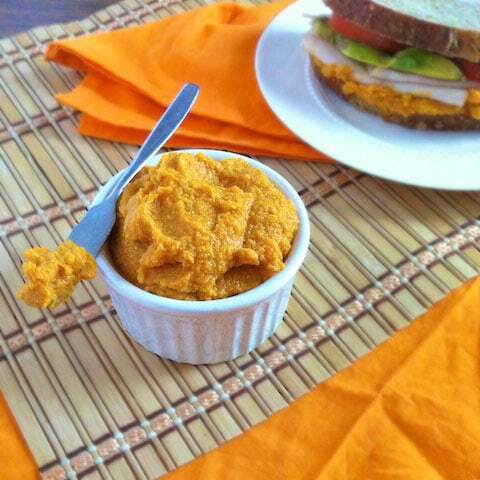 Add some great flavor to your sandwiches with this smoky carrot hummus spread! This recipe makes 2 1/4 cups that will stay good for up to 10 days in the refrigerator in a sealed container. In a food processor, blend together carrots, garbanzo beans, lemon juice, garlic cloves, paprika, cumin and pepper. While processor is running, slowly pour in olive oil. Process until smooth. To make a sandwich, spread 2 tablespoons of carrot hummus on one slice of whole grain bread of your choice. Top with avocado, tomato, turkey or your favorite sandwich fillings. Top with another piece of whole grain bread. We always bring fresh fruit and also hummus and crackers..such an easy protein snack! My favorite picnic foods are fruit salad or watermelon pieces, pasta salad and if there was a grill brats and burgers or sandwiches. I like bringing cold fried chicken, potato salad and watermelon. My favorites are homemade potato salad and fried chicken. I like to bring chicken salad sandwiches. Mom’s Potato Salad and Sweet Vidalia Onion Pie! I like to bring chicken dip and chips or fresh fruit. Fried chicken and potato salad. I love Macaroni Salad, Potato Salad and of course, Watermelon! I love to bring submarine sandwiches. cole slaw, sandwiches and a lot of sweet tea. No where is cold fried chicken so good as on a picnic. We like to bring a veggie platter. I like a european cheese plate, crackers, and wine! Most of our picnics are pb&j because they tend to be on hikes, but I love to bring sub sandwiches and yummy salads!